Over the past few years, Samsung Electronics has been in fierce patent battle with Apple. It still remains to be seen which company will claim victory but the dispute has brought mixed results to the Korean technology giant so far. A U.S. jury gave a $1.05 billion victory to the California-based firm, while courts outside of Apple’s home turf have generally ruled in favor of Samsung, thwarting the U.S. firm’s claims. 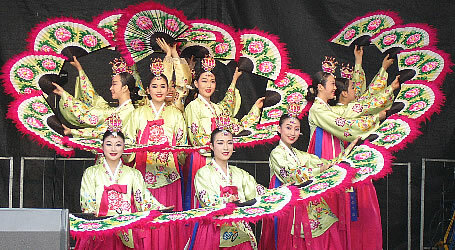 However, looking at the broader picture, it seems that things are turning more in favor of the Korean firm. Ever since the dispute began, Samsung has widened its market gap with Apple in the smartphones market. More importantly, its brand value globally has improved remarkably, while its rival’s has been stuck in a status quo. ``I’m positive our brand equity is going to see a steep increase over the next few years. Samsung Electronics aims to become the top five in brand value by 2020,’’ said Samsung Electronics Chief Marketing Officer (CMO) Sue Shim in an exclusive interview with The Korea Times at her office in Suwon, Thursday. This is the first time that the CMO has unveiled the firm’s internal brand ranking plan. 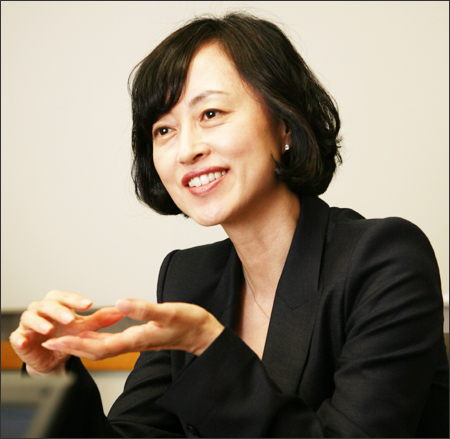 Among a total of 34 executive vice presidents inside Samsung Electronics, Shim is the only female. ``As CMO, I am so proud of seeing Samsung’s steady but large rise in brand value. Brand is crucial in reflecting a company’s representation and consumer awareness,’’ said the executive, who was a former Proctor & Gamble marketing specialist. Shim handles all Samsung marketing and branding strategies. The company recently renewed its jersey partnership with Chelsea through 2015 and the company is also an official sponsor of the Olympic Games. This year was truly a milestone for the Suwon-headquartered Samsung Electronics as the firm’s brand value grew a stunning 40 percent from the previous year. 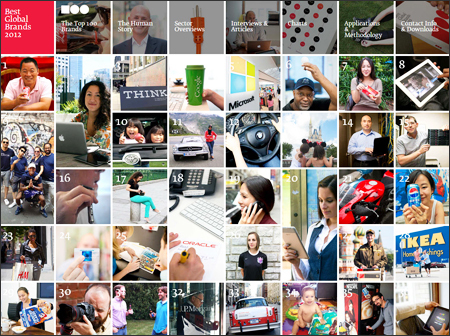 It jumped to 9th from 17th, according to the latest study from Interbrand ― the world’s leading brand consultancy. Shim attributed the progress to an impressive performance in the mobile business, enhanced leadership in TVs and improved brand consistency, along with other brand strengths across many categories. The company is also ranked fifth in the global information technology (IT) industry. Samsung Electronics’ brand value has showed a phenomenal increase helped by a stellar business and an improved brand performance, as the figure went up 92 percent from $12.4 billion to $23.9 billion, according to Interbrand . The contribution of the mobile business increased from 53 percent to 73 percent. The brand value of Samsung televisions also showed continued growth, while IT, monitor and domestic appliances showed a healthy 10 percent growth increasing the brand value from $1.8 billion to $2 billion. The semiconductor brand also showed a stable performance. ``Another hidden point is Samsung has improved skills for communications and I can say that’s also why we saw a large jump in brand understanding,’’ the executive said. The average brand value of ``Top 100 companies’’ grew by 10 percent this year, while Samsung Electronics’ average growth among consumer electronics and IT industries was 16 percent. Referring to the company’s passionate efforts towards brand, the CMO said she is seeing a consistent bearing of fruit even in once-untouched territories such as Africa. ``I visited 33 countries across the globe to check out our real status. But I was impressed to see everybody acknowledged Samsung. Regardless of region or country, our brand recognition is now near 100 percent,’’ Shim said. ``We must consider why we do it and why we exist as a company. This evolution in thinking will guide our brand strategy and set a new direction,’’ she stressed. Some say the ongoing global legal patent war with Apple has made a significant contribution to Samsung’s corporate value. ``I have something to say. But sorry, in this issue, I am not authorized to officially speak about the Samsung-Apple patent litigation issue,” the CMO said. When asked about strategies to achieve the ``top 5’’ goal in terms of brand value by 202, Shim said: ``Samsung will maintain consistency in branding. Consumer value is our top phrase.’’ According to Shim, consumers value the rich and diverse experiences offered by products rather than focusing simply on the device itself. ``We’ve seen some improvement in brand consistency. But we are being asked to maintain that path. This is the pre-condition for us to enter the global top five,’’ she said. To better handle Samsung’s brand campaign, Shim’s team began identifying everyday consumer requests related to values. The team saw that by addressing familiar weak points, Samsung products could offer more satisfaction. To illustrate this connection, brand experts invented various new tools in which all weak areas pointed out by consumers were personified. Referring to the bullish sales of its Galaxy S III smartphone and other Web-connected devices, the CMO stressed the so-called aspirational brand campaign that a good example of Samsung’s search for consistency in brand value. ``That’s why Samsung put `designed for humans’ phrase in our strategic Galaxy S III smartphone advertisements, as we want to create a human-centered brand campaign that illustrates how Samsung products provide people with more efficiency, more time and a more enjoyable experience,’’ Shim said. ``The campaign will continue next year. We have plans and we’ve been making profits as our products are selling well. What I have to do is to execute very fine-tuned strategies according to markets,’’ she said. In line with the plans, Samsung plans to invest more to strengthen its ability for marketing management. ``This is about our management philosophy. We have competitive products, however, we were rather passive in letting consumers know our philosophy. Brand needs to be equalized with corporate philosophy. As the company is stable in terms of businesses, I will be more active in marketing-related campaigns,’’ the senior executive said. When asked about companies that Samsung wants to benchmark, she didn’t specify any particular one, though the CMO admitted she is spending more time studying best practices at Western companies. ``In terms of brand strategies, Samsung should learn from many cases; and so I am studying some brands that saw a large and effective rise in value,’’ she said. ``It’s very tough to set up detailed marketing plans. Implementation and execution are different issues. Consumer preferences are varied and they are getting smarter in an era of smart devices. It’s nonsense that a single company is perfect in everything. That’s what we saw decades ago. That’s why we are open to learn more from other companies,’’ Shim emphasized. ``The critical question is finding out from a brand what we are trying to achieve. Different brands surely have different objectives depending on what market segment they are trying to address,’’ she continued. Pointing to steep rises of tech companies such as Google, Apple, IBM and Intel in brand value, Shim said this trend is more than a surprise as it shows how aggressively technology has invaded the top of Interbrand’s charts. Among the top 10, Apple clinched second place in the list only behind Coca-Cola, followed by IBM, Google, Microsoft and Intel. But not everyone in technology came out a winner this year ― Microsoft, Nokia and RIM were among those that took a bruising ― but Interbrand’s rankings hint that it’s far better to be making tablets and smartphones than designer handbags. ``That’s why Samsung Electronics is offering a wide variety of products across all parts of the world. We enable new and enhanced possibilities for all,’’ the CMO said. 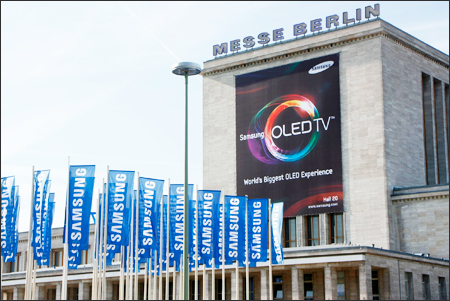 Samsung flags and a poster promoting its OLED TVs are displayed at Messe Berlin during the IFA tradeshow in August. The global awareness of world’s largest electronics maker by revenue has been soaring in recent years. The CMO didn’t give any details on Samsung’s sports marketing, though the company considers this another vital communication strategy enabling it to create a stronger emotional bond with consumers. Through its global sports sponsorship over the last two decades, Samsung has increased its brand value, quite considerably, according to Shim. For some major multinational companies such as Samsung, major sporting events are about business and marketing. The International Olympic Committee (IOC) is expected to rake in around $1 billion this year through corporate sponsorship. Shim was also positive about returns that Samsung got via these sports marketing campaigns, saying they are the right platform to expand Samsung’s global reach and to further develop relations with its consumer base. ``Samsung believes sponsorships with Chelsea and the Olympics brought excellent returns so far,’’ she said during the interview. With the 40 minutes given time gone, Shim hurried out of the interview room located at the bottom of the R4 building as she had business meetings with overseas clients scheduled.